Duct work that is an incorrect size can cause unnecessary noise, increased energy costs and lower air quality. 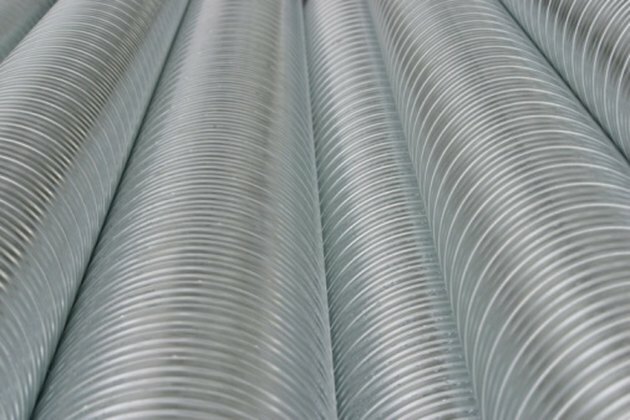 Duct systems distribute air from a heater or air conditioner throughout a home. Before calculating the appropriate duct size, individuals will need to determine the required cubic feet per minute for a given room. CFM measures the amount of air that will be moved into the room. A duct sizing calculator may then be used to determine appropriate duct size. Duct size can be determined with an online duct calculator. Determine the required cubic feet per minute for your home. This can be done by using the free CFM calculator found on the CSGNetwork website (csgnetwork.com/airexchangecalc.html). Measure the width, length and height of the room you wish to add ducts to and enter these numbers into the calculator. For example, a room that measures 8 feet long, 8 feet wide and 12 feet tall would require a CFM of 76. When entering calculations, target air changes should remain at six. Open the Standex ADP website (standexadp.com/sysdesign.php) to view the duct system calculator. Record the CFM calculated in Step 1. This will indicated what size, in inches, the air ducts should be in your home. Notice that different numbers are given for round and rectangular ducts. Jeremy Radey has been writing professionally since 2008. He began as a research assistant, which led to his own historical research presented at the National Conference of Undergraduate Research. Radey graduated from Xavier University with a Bachelor of Arts in history and education. What Is Under Air Square Feet?